We were so broke after my daughter was born, so I read a book from the library called the Tightwad Gazette, and got a lot of earth-friendly, cheap ideas on running your house. I think that's when I first considered actually washing the cloth diapers my kid was wearing (someone gave us 3 months of diaper service for a baby gift), making baby food (fewer fillers and preservatives and cheaper!!!). It turns out a lot of the frugal things to do are very good for the environment. And another book, the Mommy Made one I mentioned, even had good ideas for making and freezing the meats, and great tips on picky eaters and order of introducing foods. Altho' it sounds like most of our kids did fine, eating wise. I spent a couple hours a week making foods, pureeing them, and freezing them in ice cube trays. When I fed her, I just popped an ice cube or two of squash into a bowl and heated it. Of course, she kinda transitioned into eating table food by about 11 months and I still sometimes find a cube or two of beans or chicken in the freezer when I'm hunting for something else! LOL! 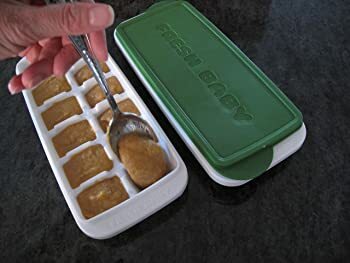 I also saved a few baby food jars, and so when I'd go out, I found the food would melt to just about room temp by the time I needed it. It worked well for my weekly MOMS group lunch at the park.